With construction on the new Four Corners/Geneva MBTA commuter rail station well underway, local developers are preparing for the new stop by remodeling and repurposing a longstanding neighborhood landmark. The AB&W Building at 157 Washington Street, built in the 1920s, has always housed local businesses, but the Codman Square Neighborhood Development Corporation (NDC), which bought the property in 2007, plans to turn the space into a 24-unit housing complex, which they hope can help turn this stretch of Four Corners into a bustling commuter and commercial center. Codman Square NDC director of real estate development Mark Dinaburg said the 28,000 square foot site is a “key transit oriented development” due to its proximity to the commuter rail stop little more than a block away. The station is set to be complete about three months after residents move into the restored building. According to local historians and neighbors, the building was originally used as an automotive showroom until shortly after World War II, at which point it operated as a candy factory and was a regular hang-out for neighborhood children. Following the factory’s closure, a local business owner re-opened the space in the 1980s to produce automotive parts, calling the company Americans Black and White, a reference to the diversity of the Four Corners area. The business operated until 2005, when the empty space began to draw the attention of CSNDC. After purchasing the building in 2007 and unveiling their plans to neighbors, the CSNDC downgraded their initial plans to build a 33-unit complex and have promised to maintain the building’s historic facade as a way to recognize the area’s architectural and industrial history. Marvin Martin, the executive director of the Greater Four Corners Action Coalition, commended the Codman Square NDC for keeping residents informed during the planning process and said the current design has been largely approved by the community. While Dinaburg said the location would be ideal for residents who work closer to downtown, he also sees 3,300 square foot retail space built into the development as the another step towards a strong business district that could attract shoppers from outside the neighborhood. While no tenants have yet signed up for the retail space, Dinaburg said Codman Square NDC are looking to draw in a community cafe and maintain a public art space with a rotating selection of local pieces. 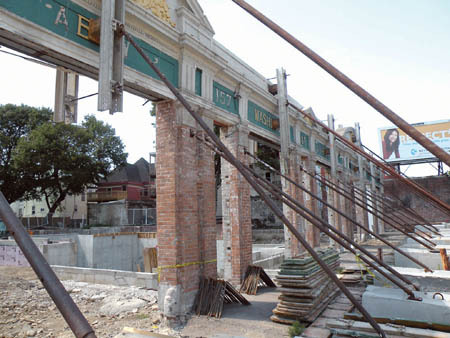 Dinaburg is not the only one with high hopes for the Washington Street project. Four Corners Main Streets board member Jamaal Leek anticipates that the added residential space will increase the number of shoppers frequenting local businesses, while commuters headed to the Fairmount Line will be exposed to a growing number of new shops ringing the station. Although many see the development as a way to draw shoppers into the Four Corners area, Dinaburg was quick to point out that as a limited equity co-op, families can become shareholders in the building for about the same cost as a single month’s rent. Under the limited equity model, residents will have some control of the building’s operations with the assistance of a management group for the first 15 years, but then full control could be shifted to tenants if Codman Square NDC feels they are ready for the responsibility.